Nowadays, it is hard to find a woman who is absolutely happy with her hair. There are tons of hair problems we all need to deal with and hair loss is a major one among them. In fact, excessive hair fall has become a universal problem these days and I’m also not out of the loop. Hence, when I saw the advertisement of Indulekha Bringha Oil that promised respite, I picked up a bottle immediately. 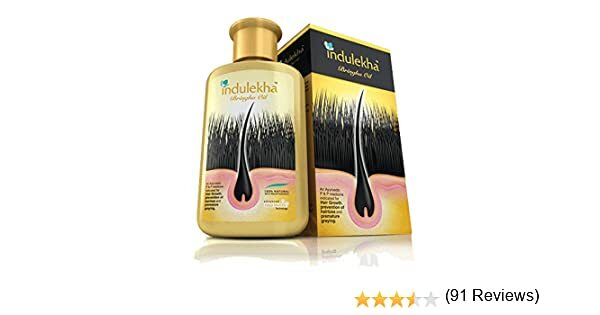 Indulekha Bringha Oil is an Ayurvedic formula that has been widely advertised to be a medicine for hair growth, prevention of hair fall and premature graying. Read on the review to know about my experience with it. It comes in a 100 ml. plastic bottle that is priced at Rs. 432. I was surprised to see that there are loads of people who are buying and trying it despite such a steep price tag. Indulekha Bringha Oil claims to be a safe, healthy and completely natural remedy for controlling the rate of hair loss. It is suggested for all three stages of Hair Care referred in Ayurveda, namely, ‘Kesavardhanam’ or hair growth, ‘Kesapathasamanam’ or prevention of hair loss, and ‘Palitam’ or prevention of premature graying. It is enriched with herb, such as bringha, amla, aloe vera, and neem steeped in virgin coconut oil. For the first week, I used the oil as per the instructions. I applied a capful of Indulekha Bringha Oil to my hair every night, massaged it well into the scalp, and followed it up with a wash every morning. However, once you are through the first week, you can use it in place of your regular oil an hour before your hair wash – be it every alternate day or two days a week. You can also use a few drops of the oil after each hair wash in order to tame your flyaways. Indulekha Bringha oil gets a light brown color from all the herbs present in it and has a really strong smell. Its consistency is just like the coconut oil and only about a capful is sufficient for medium long hair. I sometimes even apply the oil only to my scalp and use regular coconut oil for the body of the hair. Though I experienced a lot of hair fall while washing my hair every day in the first week, it subsided a bit later on. After week one, I made sure that I apply a substantial amount of oil to my hair before each wash. I massaged my scalp really well for about 15 minutes in order to revitalize the roots and left it to soak for an hour. Then, I tried washing it off with shikakai powder, but the hair oil was not washed off easily. Rather, it needed shampoo to be washed off completely even during the last rinse. I could not get myself to apply it after the hair wash, considering how strong its fragrance is. It does add a lot of bounce to the hair and also helps in fighting dandruff. Though I found the hair fall to be reducing slightly, my hair has not gained extra length. Maybe it needs 5-6 months of continuous usage to see hair regrowth. I am currently on a break from using it during winter since excessive usage of Bringha can sometimes induce cold and cough. But yes, unless the hair treatment is coupled with good food, exercise, and regular trimming of hair, it certainly will not show any remarkable result. Will I repurchase? Yes, anything to stop hair loss! Some users have experienced excessive hair loss after switching to Indulekha Bringha Oil. According to few users, hair fall started increasing after they stopped using it. The oil has a sticky element and it makes hair bit greasy. There is a possibility of getting cold and cough because of its cooling properties.